We all know that moving boxes are an awesome transit tool. However, what are the characteristics of the most effective ones? It might go without saying, but it still needs to be said; the best moving boxes are of the highest quality. A lot of people tend to buy boxes that are low-quality moving boxes just on the grounds that these boxes are cheaper and they are looking to save themselves some money. However, if you are really in the market for the best moving boxes, then you will understand the place of quality and you will definitely not want to compromise on it even if it means having to pay some extra fees. The best moving boxes will be able to make your entire moving process more efficient. By taking items and keeping them organized, they will reduce the number of trips that you need to make and ensure that you are able to pack quickly and with minimal stress. However, the flip side of this is people stuffing their moving boxes so much that these boxes end up busting open. It is important that you watch how full your moving box is and work with that capacity. The durability that you get with the best moving boxes is also another reason why you should select them. Durability means that these boxes will be able to hold their shape and ensure the protection of your items while in transit, regardless of how long the moving process takes. If you are of the opinion that an effective moving box is one that serves various purposes, you’re wrong. 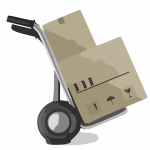 The best moving boxes are purpose-specific, and they are able to carry out their specific purposes well.